Since the oil boom in western North Dakota began several years ago, the roads in this sparsely-populated corner of the state have been taking a beating. A typical shale oil well requires 2,300 truck trips in its lifetime, driven mostly over gravel roads. With nearly 6,800 wells currently operating in the Bakken oil field, that’s a lot of heavy traffic. County road commissioners are struggling to keep up with all the maintenance, and dust has become a major nuisance. Now there’s concern that the dust clouds could have negative health effects: in certain areas, the road dust contains a carcinogenic mineral called erionite. Erionite -- which an August 2013 study called "an emerging national public health concern for respiratory disease" -- naturally occurs in rocks and soil around the West, and is only hazardous when disturbed. Driving, walking and even sweeping in certain areas can cause erionite to become airborne and enter the lungs, causing respiratory problems and malignant mesothelioma, a type of cancer also associated with asbestos exposure. Though lesser known to the public, erionite is believed to be a more potent carcinogen than asbestos. In the 1970s, scientists linked erionite exposure to abnormally high rates of mesothelioma in Cappadocia, Turkey, where people live in stone houses embedded with the poisonous mineral. 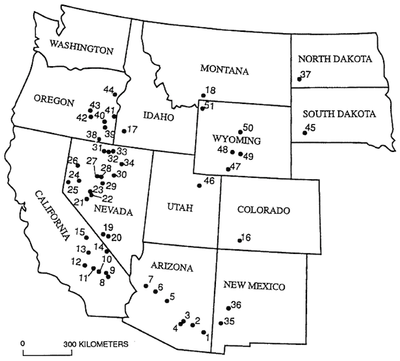 A map of known erionite deposits in the West. Courtesy USGS. According to Myron Levin, editor of the consumer watchdog news website FairWarning, it wasn’t until the mid 2000s that North Dakota geologists began connecting the dots on their state’s geology and the health risks of erionite exposure. For decades, people unknowingly dug gravel pits near erionite deposits in western North Dakota. A 2011 study found that in Dunn County, N.D. alone, over 300 miles of roads were surfaced with contaminated gravel. Since being discovered in North Dakota, researchers have set about mapping other erionite deposits to help prevent future exposures and determine whether health problems previously linked to asbestos are actually from erionite. Thus far, no one has detected any erionite-related cancer in western N.D., but a 2010 study by the U.S. Environmental Protection Agency found lung scarring on two long-time road workers. The disease can take over 30 years to develop, as Aubrey Miller of the National Institute of Environmental Health Sciences told Living on Earth in 2011. A lot of the people there say: "Well, we don’t see any disease here yet, so should we be worried?" Well, the exposures are there, and there is a long latency between getting the disease. So we want to do what we can now to start making people aware, and start being more proactive - for a public health stance - to help ensure that we don’t end up with an epidemic of disease. The National Institute for Occupational Safety and Health recommends, among other suggestions, training workers on the risks of erionite exposure, wetting roads and quarries to keep dust down and avoiding the use of gravel that is known to contain the mineral. But it’s hard to make sure people aren’t being exposed because, despite the known health risks, erionite is still unregulated by the federal government. Oil truck in North Dakota. Courtesy Flickr user Tim Evanson. In November 2011, FairWarning reported that Dunn County was still using contaminated gravel because it was cheaper than bringing it in from elsewhere. According to meeting minutes, in February 2012, Dunn County commissioners authorized the use of erionite gravel in a road project, noting that its use “should result in a significant reduction in cost.” Radig says he knows it's still being used today. And with the additional traffic from the oil boom, counties are weighing the risk of vehicle accidents, which are more frequent on roads shoddily surfaced, against an unquantifiable risk of cancer sometime in the future. And usually, Radig says, immediate safety concerns outweigh the hypothetical long-term risk. Emily Guerin is a correspondent at High Country News. She tweets @guerinemily.